Same Routine, New Year -- Let's have it ! A Christmas break is great, but it’s soon over and after wishing you all a Happy New Year, it’s back to the grind of the routine. The roads were OK for the first Monday of the year, but the queues came back quickly and the routine soon pulled me in, not unlike gravity when you bounce on a trampoline. One advantage of the days around the winter solstice is that I end up driving to work at dawn. This is not great leaving the house (when it’s pitch black) but quite lovely if the sun comes up as I’m waiting around the Argenteuil bridge (Pont d’Argenteuil). I snapped this photo at a red light, the quality isn’t great and you can never do justice to this kind of view anyway, especially not in the few seconds before it changes to green. Hope your routine wasn’t too hard to get back into. Have a good start to 2011! This entry was posted on Wednesday, January 5th, 2011 at 4:31 pm and is filed under France, general, photography. You can follow any responses to this entry through the RSS 2.0 feed. You can leave a response, or trackback from your own site. I love the early morning too, which is easier at this time of the year! Bonne Année. Bonné Année à vous aussi ! Ha ha I have no routine! I do have to start work as early as 5am quite often though and watching the sun rise over Europe whilst eating my breakfast at 37,000ft is something I will never get bored of seeing. Who knows? 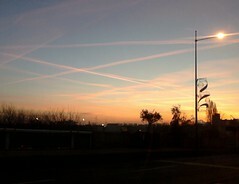 Maybe I helped to create one of those contrails in your pic? Lovely to see you here Helen! The breakfast you get at 37,000ft must be nicer than most of the crap I’ve eaten on planes trying to pass itself off as breakfast ;-). Suppose you can bring your own on board though. One of the contrails could well have been you, indeed if you’re coming in to CDG from a western approach and you’ll be flying pretty much over my house too! Clinton's artful denial: "I didn't put words in her mouth."